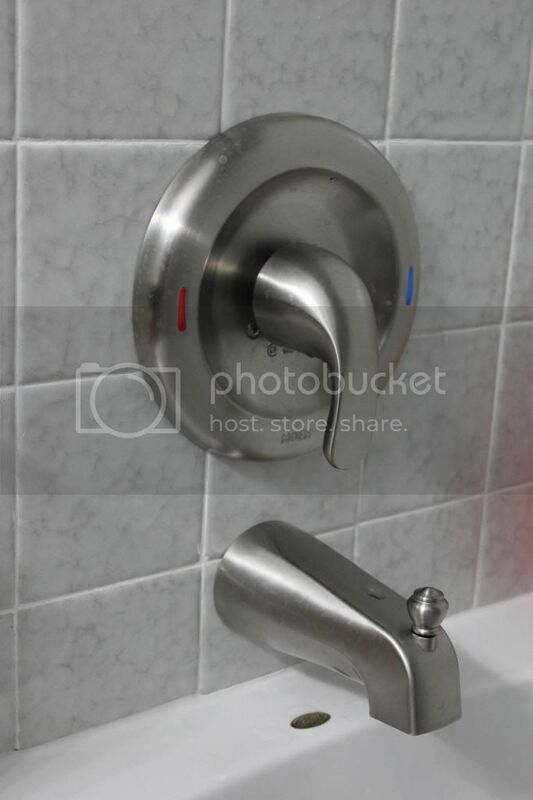 I have been waiting until the last finishing touches were added to the boys’ bathroom before posting before and after pictures. 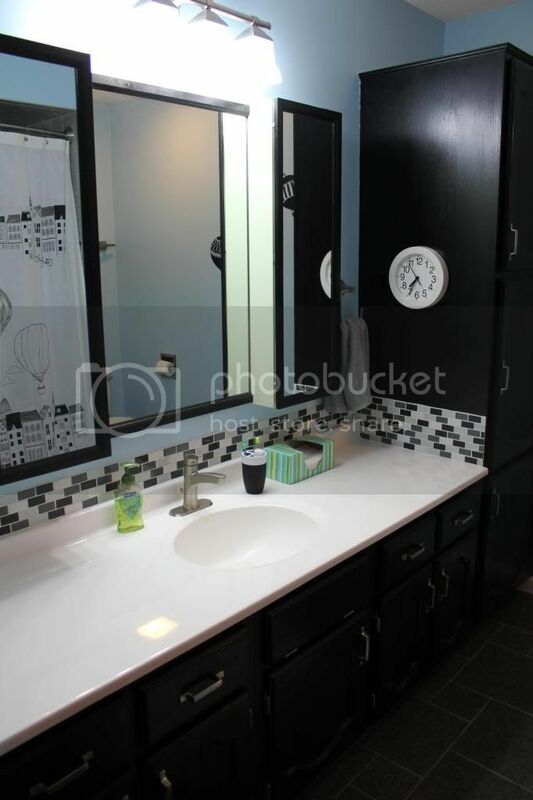 You can see a couple of pictures of their bathroom before we took possession of the home here. Gray cabinets and countertop. Blue sink and bathtub. 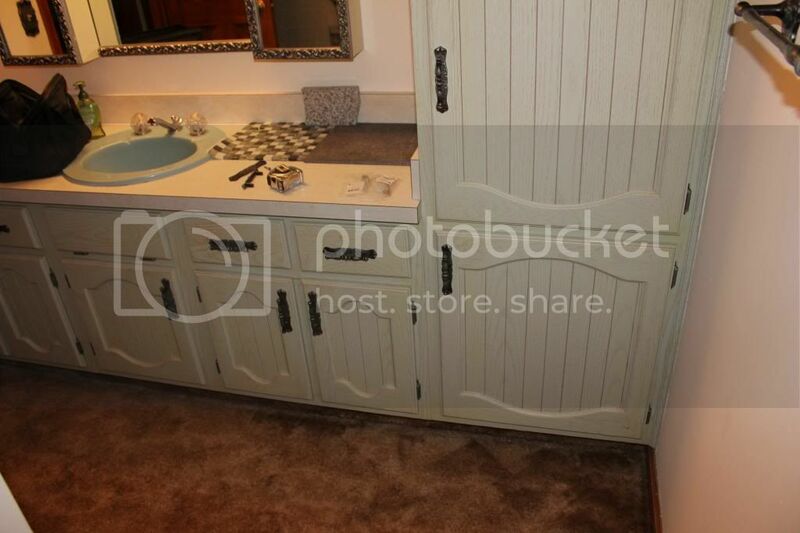 Detail: Hardware, cabinet doors, and CARPET! 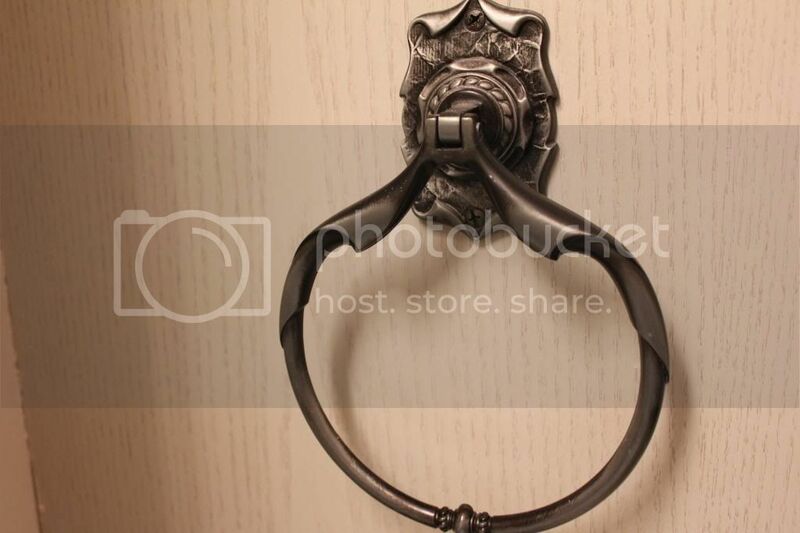 Extreme close-up of the lovely coordinating towel ring. And on the mirror/medicine cabinet — remember this for later! 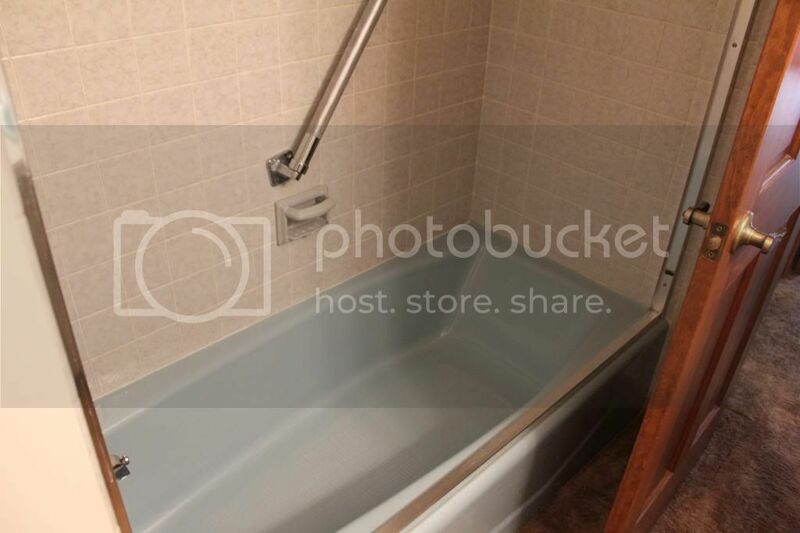 STUNNING blue bathtub + handicap accessible grab bar + track from shower doors. Track from shower doors is gone. I’ll spare you the five billion DURING pics. Ryan’s dad worked tirelessly on this bathroom. He spent several work weeks in this little room while Ryan and I were at work. 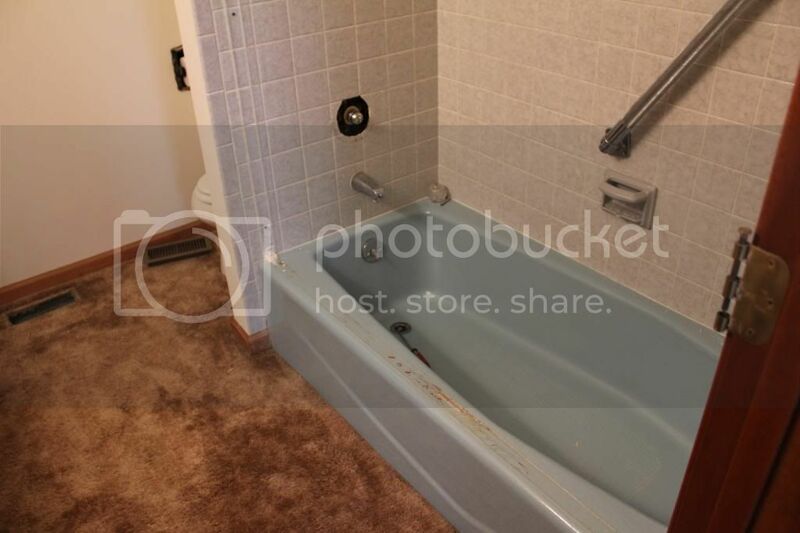 We saved the original gray tile bathtub surround, the medicine cabinet, and the cabinets. That’s about it. Looking in from the hallway. My husband laid the beautiful versailles patterned flamed granite floor from Tile Shop (as well as the laminate in the hallway). 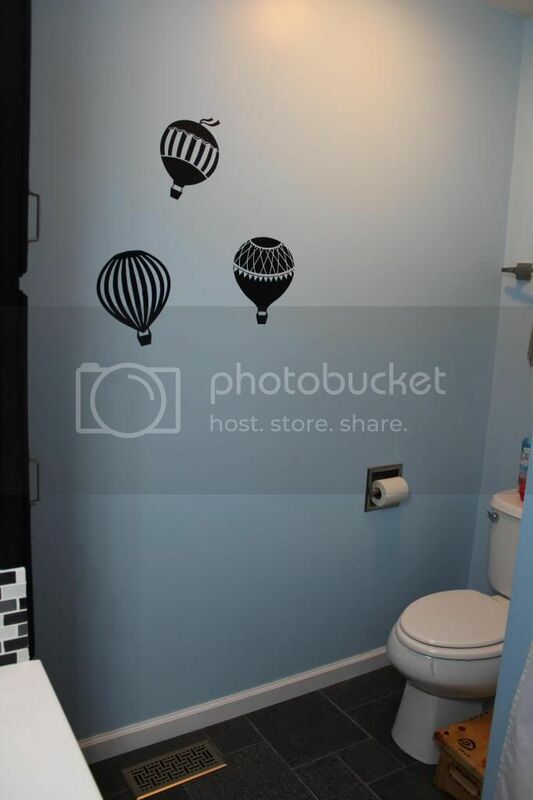 Adorable hot air balloon vinyl decals from The Custom Vinyl Shop were those finishing touches I mentioned before. I’m obsessed with how cute these turned out and I have been holding onto them for a few weeks, scared that I would mess them up somehow. So easy! Overview of vanity. New and improved! I stained the cabinets black. 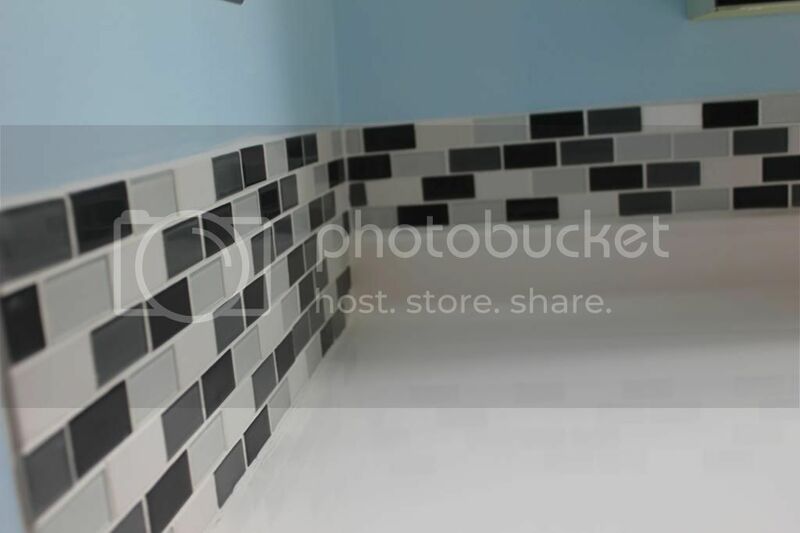 We replaced the gray formica top with white cultured marble. Ryan’s dad added the tile backsplash surround. New lighting. 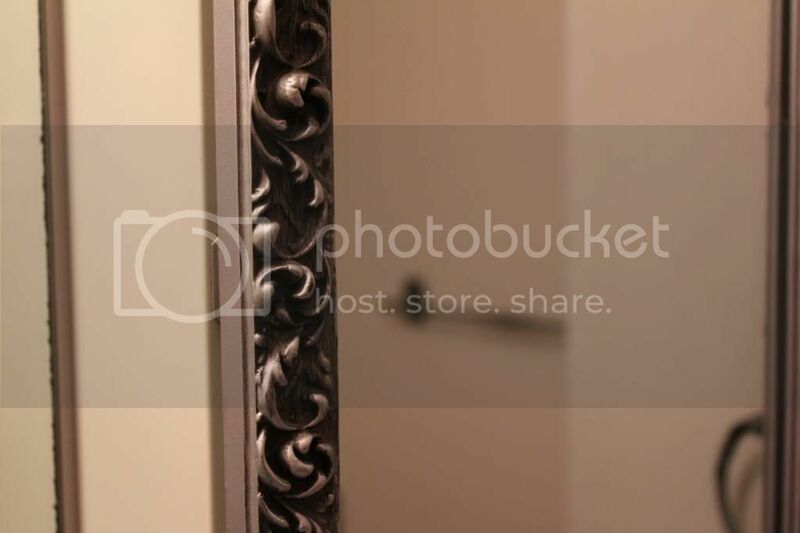 Also, notice the framing around the mirrors on the medicine cabinet. Ryan’s dad built them. Threw away the ugly swirly patterned ones above and BUILT these new ones. That saved us a fortune! 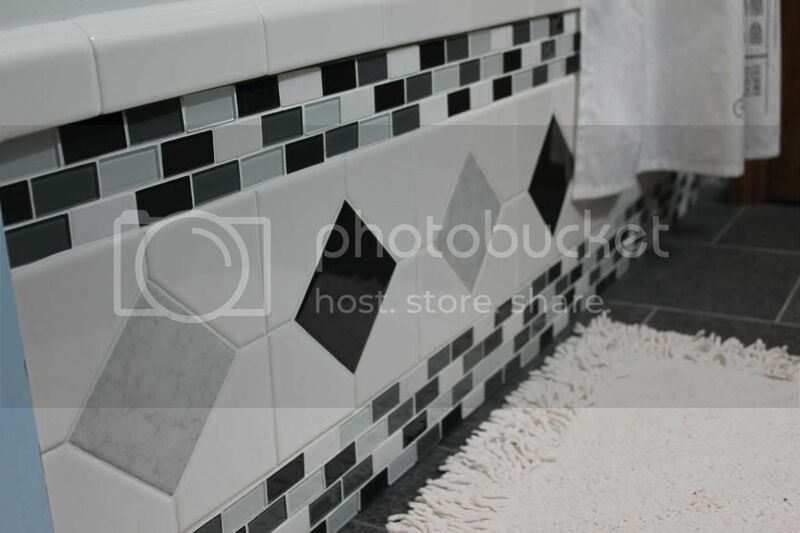 Extreme close-up of the tile backsplash surround. 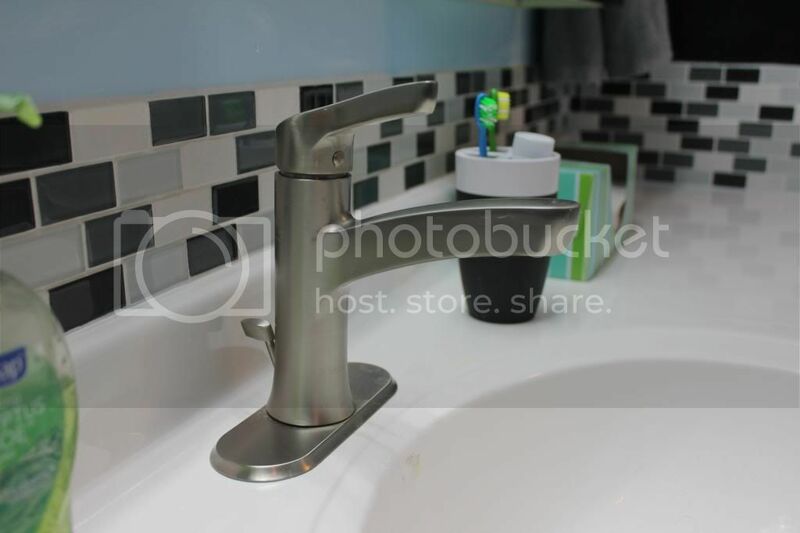 Another overview – notice the new brushed nickel hardware. More of the decals! And a new brushed nickel vent cover. Painted all the baseboards white. 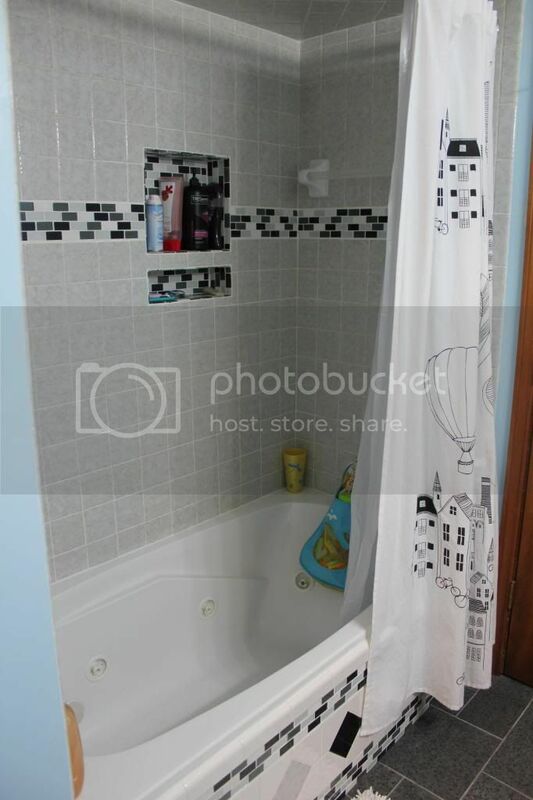 Our beautiful shower curtain! I fell in love with the simplicity of this and had to have it. Painted the walls a sky blue to add some color to the room. 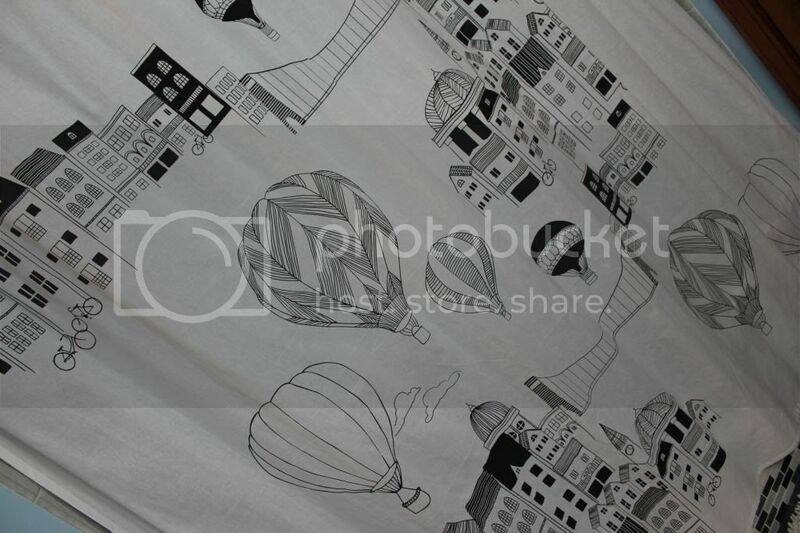 I purchased the shower curtain on clearance from Urban Outfitters. 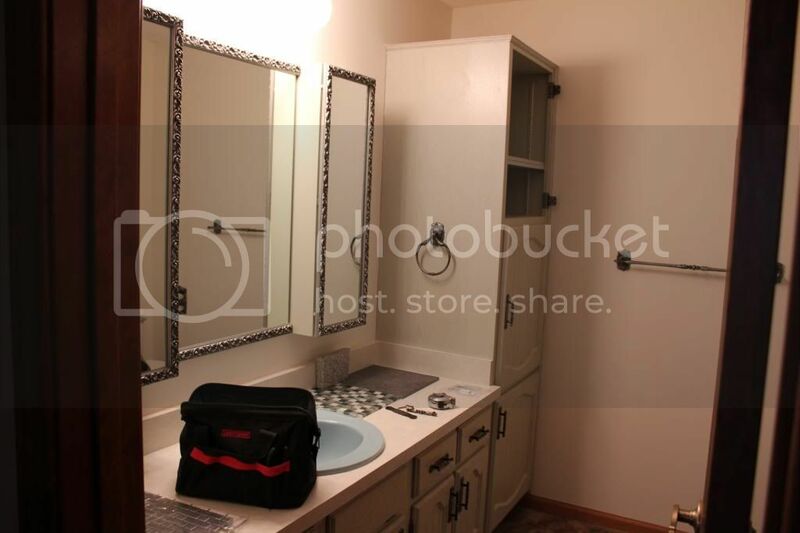 Original light gray tile with new accent stripe and toiletry shelves/boxes, no grab bar, and new jetted tub! 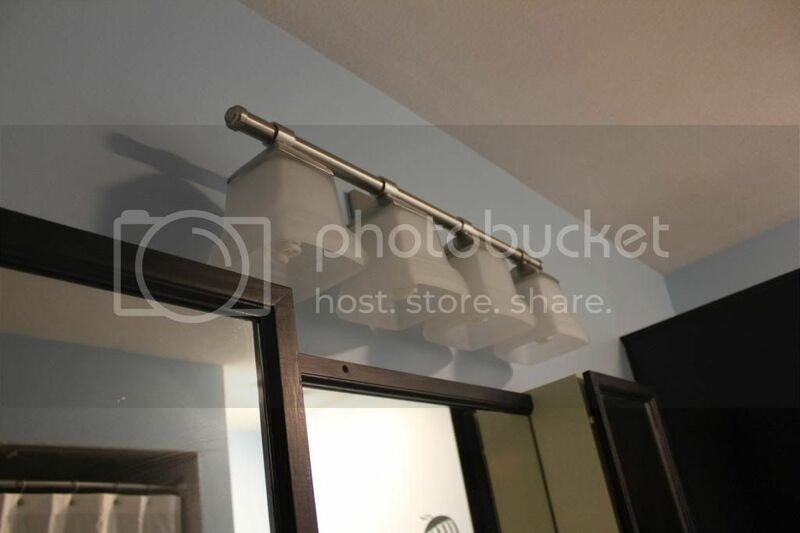 New towel bar. This custom tub apron was the source of a lot of discussion and agony for us. It held up progress while we were trying to determine how to combine the old gray tiles with the new. This is the design that Ryan and I finally came up with and Ryan’s dad put it together for us. I am so proud of this and love that it is totally custom. Every time I bathe the boys in this bathroom, I’m happy. One of the smallest rooms in the house, and definitely one of my favorites. While I felt somewhat compelled to go with bright colors, I like that the room is whimsical and fun without being too childish. 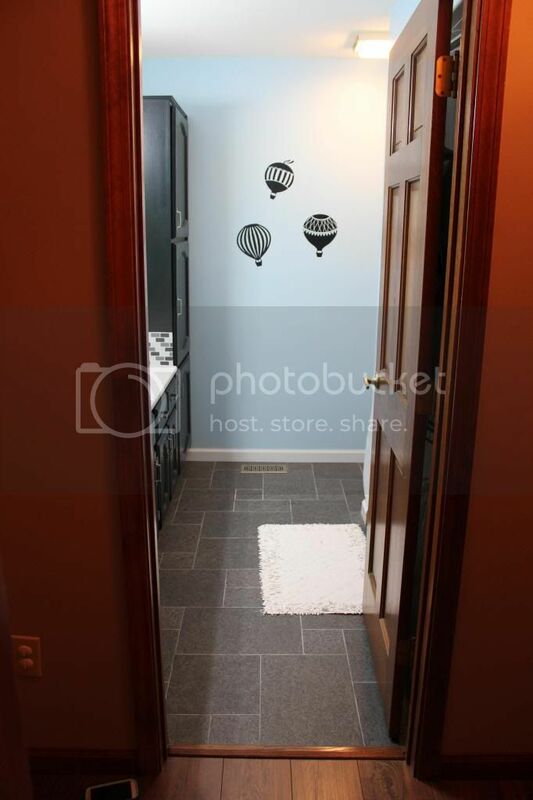 This bathroom also serves as our guest bathroom and I think the colors/design will grow with the boys’ changing interests. I’m not crazy about the idea of characters but if that’s what they want one day, the tile is neutral enough to look nice with a variety of themes. 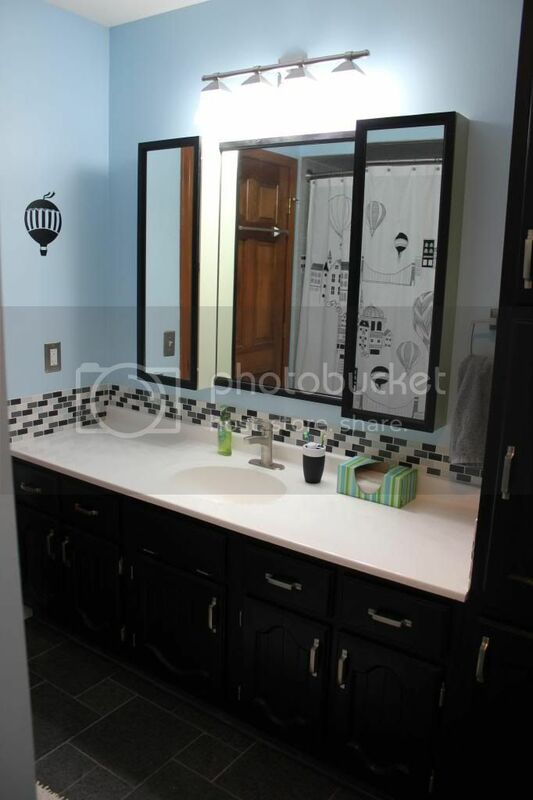 I can’t even believe the transformation this little bathroom has gone through. Now we just need to work on the rest of the house. I’m excited to hear your feedback!